Every effort to keep groups in the same boat (sometimes not possible if group is greater or less than 8 passengers). Please be here 1 hour before your departure time. Mud sliding is available upon request. Our Rafting Waiver – Please print and complete this waiver. Children must be 6 years old and weigh at least 60 lbs to participate in the rafting. Group Bookings Note: To receive your 10% discount, payment must be made on one reservation by one group leader for bookings. We’ve found the best way to do this is to appoint one person to collect everyone’s share. You’ll find this makes your Check In much quicker. We provide every effort to keep groups in the same boat but sometimes this is not possible when there are less than 8 people in a group. A 50% deposit is required to confirm your rafting booking. Cancellation in writing must be given 10 or more days prior to the scheduled rafting date to receive a deposit refund less a $20 administration fee, or 2% of the deposit, whichever is greater. 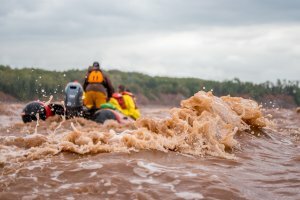 Any cancellations or change in numbers made less than 10 days prior to the scheduled rafting date will forfeit the deposit. Cancellations inside 24 hours and no shows will forfeit the deposit, and be charged the remaining balance in full. Our two hour trip covers approximately 9 km, (6 miles) one way. This is a great way to experience the full effects of the river without missing any adventure, just a shorter version. Great for people short on time or with young children. Click here to view our feature video. Our four hour trip covers the longest section of river, 18 km (10 miles), with impressive scenery on the way downstream and more rapids on the way back. This trip covers more of the river and rapids than any other tour operator on the river. Click here to view our feature video. *To receive the “Stay & Ride” package discount, accomodation and rafting must be booked at the same time. Click here to book rafting & accommodations. *Group rates do not apply on Extreme Tide Weekends during July & August. Book a rafting tour and save 10% off 1 night cottage rental (must be booked in one transaction). Subject to some conditions. Weekly and monthly rates available upon request.